It's almost Halloween and we are ready. Last weekend I took the girls to a Halloween carnival at a neighboring school and they had a blast. 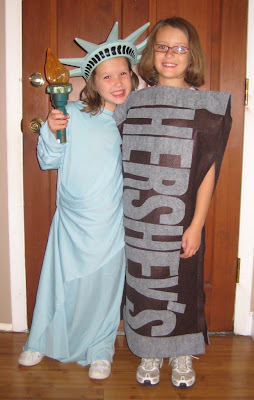 J was the only "Lady Liberty" that we saw, I thought M's costume would be unique since we made it ourselves but surprisingly we saw 2 other Hershey bars at the carnival.